A Russian scholar, who teaches Bengali, recalls her love affair with iconic Indian poet and what he means to Russians India will be formally marking the 150th birthday anniversary of iconic poet-philosopher Rabindranath Tagore next May. The celebrations have already begun in Shantiniketan, the university founded by the sage poet in West Bengal, with spirited renditions of songs, dances and plays composed by the bard. Russia, however, is celebrating its tryst with the Nobel laureate in September this year. It’s exactly eighty years since Tagore visited the Soviet Union in 1930, an appropriate time to look back at the man, his legacy, his connection with Russia and how Russians see this many-sided polymath. For many Indians, Tagore is more than just a writer and poet: he is a symbol of its cultural glory and renaissance, the first Indian to win international literary acclaim. He penned India’s national anthem, and, has the unique distinction of having authored national anthems of two sovereign countries. 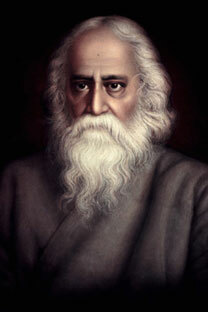 Tagore’s song (‘Aamaar sonar Baanglaa’: My Golden Bengal) first became the anthem of liberation for the people of Eastern Pakistan, and then became the national anthem of a free Bangladesh. For Benglalis, Tagore is clearly a larger-than-life figure. A Nobel Prize winner and a fellow Bengali, Amartya Sen described Tagore as “a towering figure in the millennium-old literature of Bengal”. But Sen finds it puzzling that “in the rest of the world, especially in Europe and America, the excitement that Tagore’s writings created in the early years of the twentieth century has largely vanished”. The young generation may not as familiar with Tagore’s prose, but thanks to Russian composer Alexei Rybnikov, who set the verses from the novel “Shesher kavitaa” (The Last Poem) to music, they are getting a taste of Tagore music. The song has been a huge hit mong young people. As Russia celebrates the 80th year of his arrival in Moscow, one can see preparations are much more modest than those preceding Tagore’s centenary in 1961. At that time, the second 12-volume collection of his works was published; a special stamp and a commemorative medal were released. Plays and ballets based on Tagore’s works were staged all over the country. The government had set up a commission for celebrating his jubilee. Tagore’s name was everywhere: on television and the radio, his portraits and poems were printed in all the magazines and newspapers. It was back then that I as a child first heard his name and inspired went on to devote my whole life to studying his language and culture. Incidentally, back in 1961 Matvei Volodarsky, a movie director, made a documentary called “India’s Great Son: Rabindranath Tagore in the USSR”. Watching it left me with mixed feelings. One thing that was absolutely clear, however, was that the celebration of Tagore’s centenary was an event second in importance only to Yuri Gagarin’s spaceflight, a milestone of sorts in the Soviet Union in 1961. The leaders who had invited Tagore in 1930 did so to advertise virtues of the socialist utopia. Nobody, of course, told their Indian friend that a quarter of the country’s peasants had been either exiled to Siberia or executed. What struck him the most was the Soviet Union’s success in education. According to Sen, in his Letters from Russia, written in Bengali and published in 1931, Tagore unfavorably compared the acceptance of widespread illiteracy in India by the British administration with Russian efforts to expand education. The British rulers of India promptly banned the book. Tagore’s description of the two weeks he spent in Stalin’s Russia was far more insightful than the accounts of famous intellectuals who were invited by the Soviet leadership. The music of the time may have changed, but Russians have not forgotten Tagore; they are even preparing to mark his jubilee, albeit not on such a grand scale as 50 years ago. Stripped of publicity and fanfare, it will be a sober academic discussion of different dimensions of Tagore’s poetry and his role in the Asian cultural landscape. Some publications are due. I can mention an essay by Tatyana Morozova, a music scholar, about Tagore’s masterpiece “Gitanjali,” a collection of poems for which he was awarded the Nobel Prize in Literature in 1913. A European transcription of the music is appended to the essay. Russian translation of the Gitanjali goes back to the time of the October revolution. I am translating the Gitanjali verses from Bengali because the existing Russian translations are based on the English version. This time around no government commission has been set up and the Tagore celebrations in Russia will be coordinated by the Indian embassy. When Tagore visited Russia in 1930, he was much impressed by its development efforts and by what he saw as a real commitment to eliminate poverty and economic inequality. But what impressed him most was the expansion of basic education across the old Russian empire. In stepping on the soil of Russia, the first thing that caught my eye was that in education, at any rate, the peasant and the working classes have made such enormous progress in these few years that nothing comparable has happened even to our highest classes in the course of the last hundred and fifty years…. The people here are not at all afraid of giving complete education even to Turcomans of distant Asia; on the contrary, they are utterly in earnest about it. (Tagore, Letters from Russia, translated from Bengali by Sasadhar Sinha (Calcutta: Visva-Bharati, 1960, p. 108).